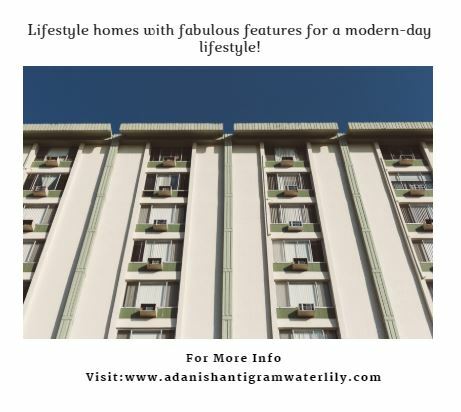 Adani Shantigram Water Lily: Beautiful residential spaces with delightful amenities to experience high-end luxury at its best! Ahmedabad is an incredible city that is rich in culture, historical landmarks, education hubs, modern-day infrastructure and more. There is so much to this beautiful city other than what meets the eye. The real estate market in Ahmedabad is booming today with a number of residential and commercial projects in different parts of the city and its outskirts as well. 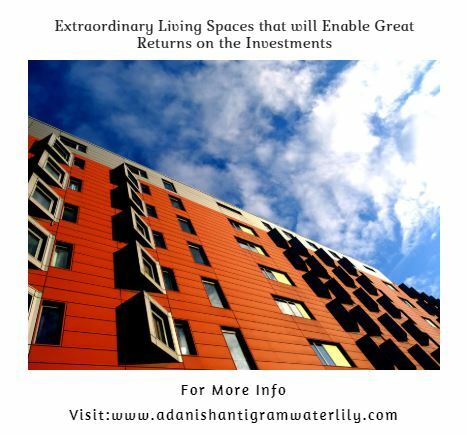 Adani Shantigram Water Lily is a new residential project in Ahmedabad by Adani Realty that focuses on high-end luxury and comfort in each and every corner. Being a part of a 600 acre township project, this development has a lot to offer its inhabitants. Extended over lush greens of 32 acres, this mesmerising residential development consists of 15 glorious towers that offer 3.5BHK, 4BHK as well as 5BHK apartments and penthouses of pure luxury and comfort that will take your breath away! With apartment/penthouse area sizes starting from 2433 sq. ft. and going up a whopping 6440 sq. ft., experience the beauty of luxury space that you and every member of your family will truly appreciate. With a wide range of options available, you can conveniently find the prefect residential space without any hassles. If you are looking out for a life of happiness and eternal bliss, this development is where you need to be! 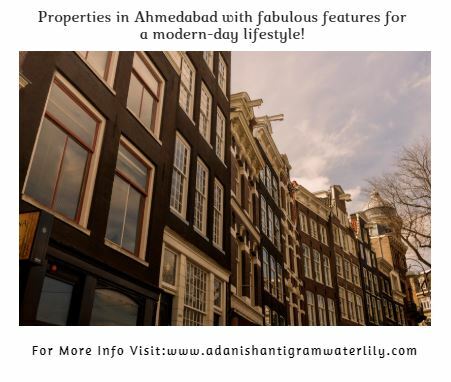 Adani Shantigram Water Lily Ahmedabad is an outstanding gated community that is packed with a modern-day lifestyle of pure luxury and satisfaction. The apartments/penthouses at this development are spacious, provide ample ventilation, natural lighting and contain luxury fittings & fixtures, decorative doors, large balconies and windows providing jaw-dropping views, high-quality flooring in every room, electrical sockets and switches located perfectly for convenient access, plush kitchens with multiple provisions, hi-tech safety features and the list goes on. This development also offers a plethora of external amenities that are crafted to delight and will always keep you busy and entertained! Without a doubt, there is something new and exciting to do each day at this development. The external amenities include a lavish clubhouse for recreation, multiple sports facilities and a play-area for your kids, theatre, gorgeous sit-outs to spend quality time with your loved ones, multipurpose hall, swimming pool, shopping centre, landscape garden, 3 high-end elevators per tower, well-planned car parking and multi-tier security for uninterrupted happiness and safety. Stay fit, unwind and relax each day when residing at this beautiful residential undertaking. Located off S G Highway in Ahmedabad, Adani Shantigram Water Lily S G Highway has a number of your daily and emergency landmarks in its vicinity and helps you save time for the things in life that rally matter. Places like schools, institutes, colleges, banks, ATMs, hospitals, medical centres, convenience stores, supermarkets/hypermarkets, restaurants, multiplexes, malls, shopping centres, cafes, public transport and a lot more can be accessed in the shortest amount of time possible. 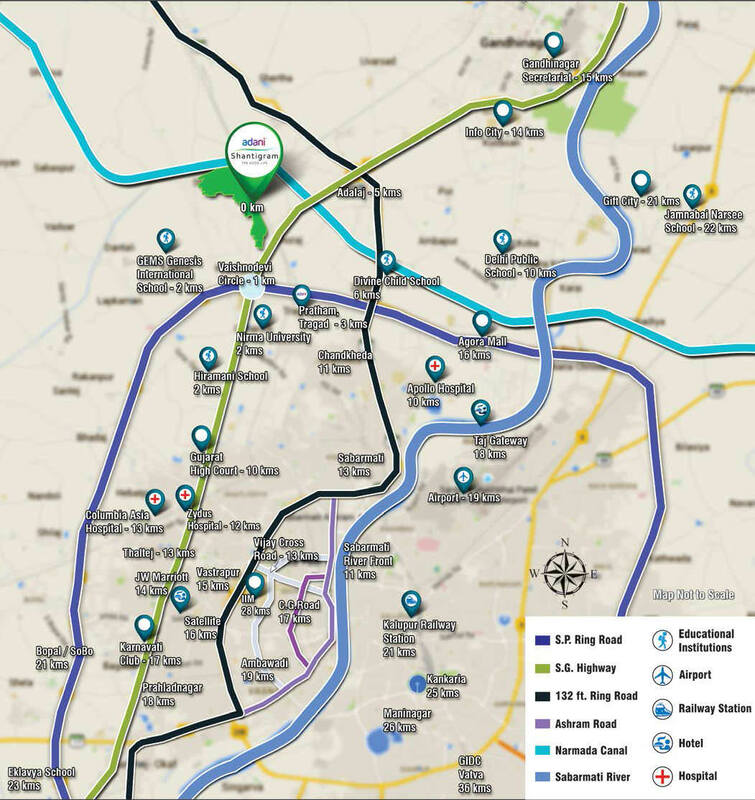 The strategic location of this development also offers easy connectivity to other prime locations in Ahmedabad. Adani Realty is known to offer budget-friendly housing with zero compromises on premium luxury and the same applies to this development as well. Starting at an exclusive price of Rs. 1.06 Crs. and moving up to Rs. 3.50 Cr., the apartments and penthouses at this development are affordable and simply irresistible. May it be a new home or an investment for that matter, a purchase at this development will surely be loved for generations to come. You can conveniently choose from multiple payment options along with home loan facilities through popular banks, NRI services, customer support and a lot more for a buttery-smooth purchase. Come, experience a new world of luxury and comfort that will satisfy your soul. Book your Dream Property in Ahmedabad Now!